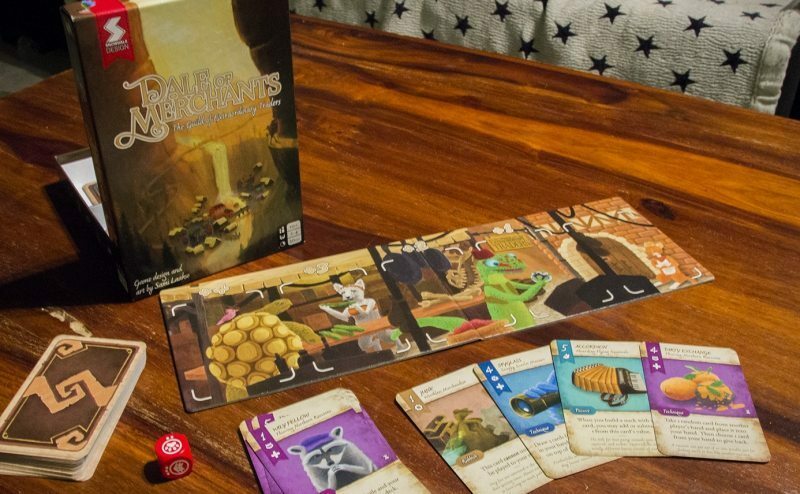 Finnish one man game studio Snowdale Design and Dale of Merchants board game. Dale full of animals competing on entering the legendary Guild of Traders. Honesty pays, but not enough for these eager animal folk who all have their way to chea…umm…take advantage of the situation to beat the rest in the race. Dale of Merchants board game is deck building game that is clearly differs from Dominion, Star Realms and other basic games from the genre. 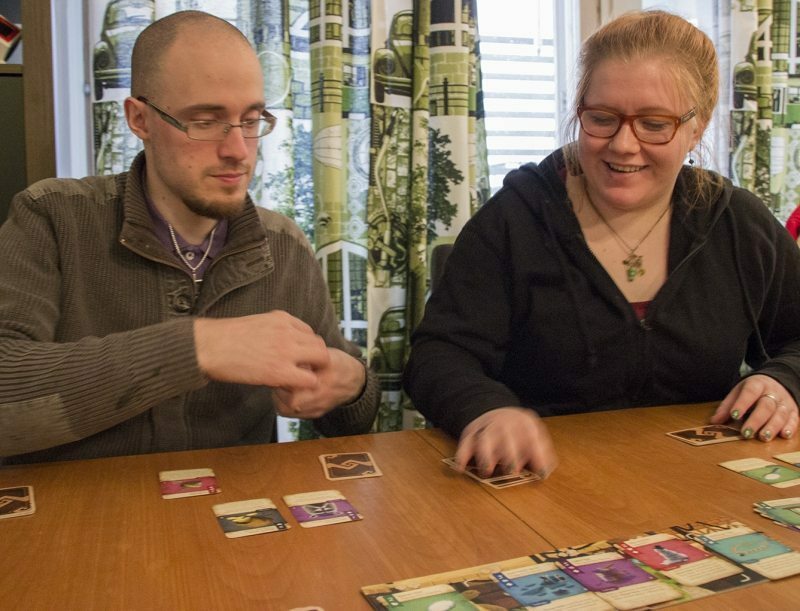 Finnish games rarely get published through Kickstarter because of the country’s juridical restrictions. 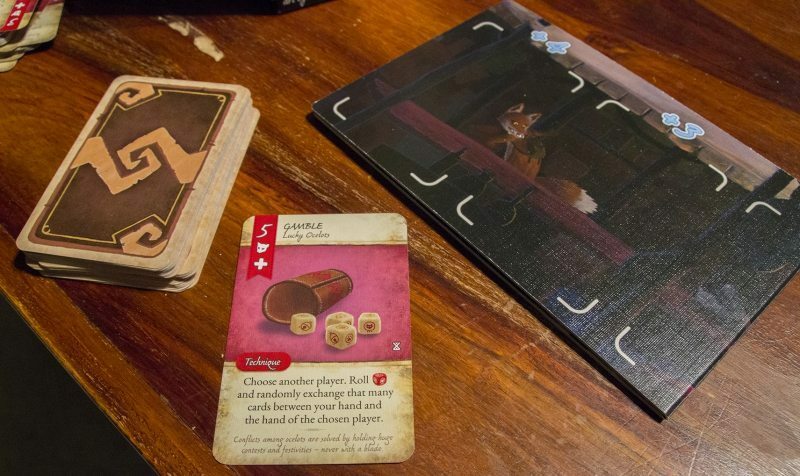 Because of this Dale of Merchants board game showing up on Kickstarter was news in itself. The reals news was a great Finnish board game as a result of the successful campaign. Even greater than this is the fact that the board game and Snowdale Design continue on their triumphant path in the shape of Dale of Merchants 2. Kickstarter campaign has only 7 days left and has amassed a stunning sum of nearly $60 000. Dale of Merchants 2 is a stand alone game that can be played on it’s own or mixed with the cards of the original game. This review is based on a copy of the game received from the publisher. Dale of Merchants board game breathes exquisite quality from the start. The game box feels sturdy and pleasurable. The material of the cards is top quality that guarantees good durability even after dozens and dozens of gaming sessions. Compared to Dominion card stock the cards in this game feel way better. The cards in 7 Wonders get close, but still loses in durability. It would be a shame to sleeve the cards, because they feel very good. It always makes me worry when the game designer also handles the art of a game. Sometimes is works and Dale of Merchants board game is a good example of this. The game has a clear personal style. The painting-like graphical appearance fits the game and it’s theme very well. 110 cards that contain junk and the decks for six different animal folk. In addition included is a die that is used when the Lucky Ocelots are in the game. The game costs about 20€ which is a good price to pay for this box full of quality. The first player to build eight stalls is the winner of the game. The value of the first stall needs to be one, second needs to be two and so on. On a player’s turn he can buy a card from the market, play a card from his hand or build a stall. The cards bought from the market go straight to player’s hand instead of the discard pile. At the end of the turn you don’t discard your hand but the cards you’ve saved stay and are ready to be used again next turn. At the start of the game the hands of the players are mainly filled with junk. In the beginning junk is somewhat useful as you can use it to buy cards. Later on junk is literally junk you wish to get rid of. Some animals are experts with junk though for example the Hoarding Flying Squirrels are good at hiding junk to their stalls. Few different animal folk are chosen to each game depending on the player count. The game feels distinctly different with different animal folk in play so you can modify the game experience according to your preferences. The Northern Raccoons like thieving, but everybody doesn’t like thieves. Then you can choose to include the more calm Pandas, who are skilled at manipulating the market to their advantage. Dale of Merchants board game conquered a spot in my heart unlike Star Realms and Dominion. Why does it make my heart beat? It was clear while reading the rules that there might be something to this game. The most crucial difference to the games mentioned earlier is the fact, that the cards at the end of the turn stay in your hand instead of being discarded. On top of that, the cards bought enter your hand and are playable next turn. This gives a lot more space to tactics and combos as you know (…well, most of the time, damn Ocelots and Raccoons!) what will be in your hand after you buy a card. Dale of Merchants board game is at it’s best with two players. It’s quick and surprisingly tactical game. 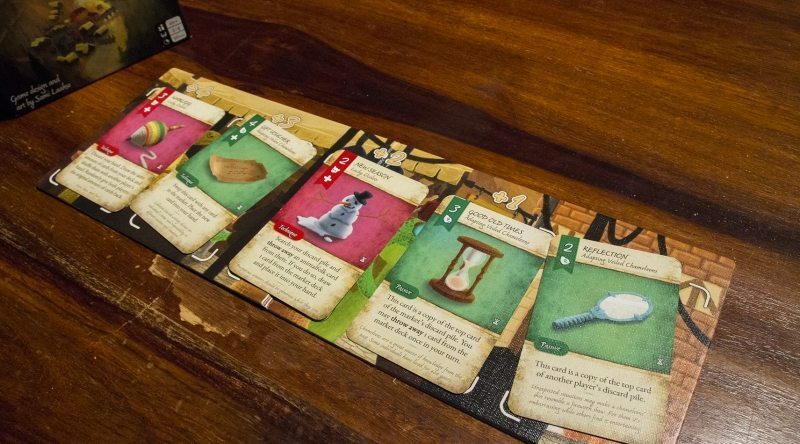 At the beginning of the game, there are only five cards in the market and in players’ hands so the players are able to decide what to do quite quickly. The strategy forms depending on the cards that are in the market, so you need to adjust during the game instead of the whole strategy being clear from the start like in Dominion. After getting to know the different animal folk and the game, the players know how they combo together and that might give a good foundation to the strategy. With four players we’re facing a slightly controversial case. The length of the game stretched a bit too long even with players who had played the game before. The chaos in the game increased, but in a way it was actually enjoyable. Surprising situations rose more than in the two player game, but the game gives you ways to deal with these situations. There was no feeling that you couldn’t influence the outcome of the game. The game feels exciting until the end of the game, because all the players might be on the verge of building their last stall. If the length of the game wouldn’t stretch too much from the 30 minutes the game would be very good with four players too. Dale of Merchants 2 has a team rules which might fix this problem. Choosing the animals for a two player game for a game organizer that is searching for perfection might be slightly hard. The familiar feeling from Dominion creeps in. I want to choose the perfect decks for this game to make it as fun as possible. What if I could have chosen better decks? What if I wanted to include all the animals? In the four player game the choice is a lot easier, because only one of the decks is left out. Originally I was driven away from the Kickstarter because of the amount of English in the cards. There are people in our game group that aren’t really fluent in English. According to the designer, the pictures in the cards are designed to help in remembering what the card does. This is mostly very true with the exception of few cards. In the first games the amount of English is a problem though. The cards need a bit explaining and there are quite many different ones included. The English in the cards is quite simple though and basic English skills are enough to survive through the game. Few words might need to be translated because they are a bit rare and game specific. There might be a lot or very small amount of interaction between the players depending on the animal folk chosen. In my experience none of the effects in the cards were frustrating and even the most vile effects were well designed as players are able to protect themselves quite well with little planning. Theme in Dale of Merchants board game is surprisingly deep starting from the manual. Every animal folk has a certain feel to it and the art serve the actions. Flavor text is a great addition that deepens the story. High quality, quick strategy card game in a small package. Dale of Merchants is very close to must-buy border. If you play a lot with two players, you should get this game. If you play mostly with four, Dale of Merchants 2 (or both) could be a good bet. If English language is a big problem I wouldn’t recommend Dale of Merchants. If it’s not, I recommend this game that deserves it’s place on the shelf, taking the spot of a solid strategic filler. Dale of Merchants is an awesome deck building game, that doesn't suffer from the faults of Dominion. The art and the game world are superbly designed.